Many of my spiritual mentors are writers — persons whose works inspired me, guided me, even, in a few cases, changed my life. I am grateful for them. They are persons who have provided some light along my spiritual journey. But they are not all writers! 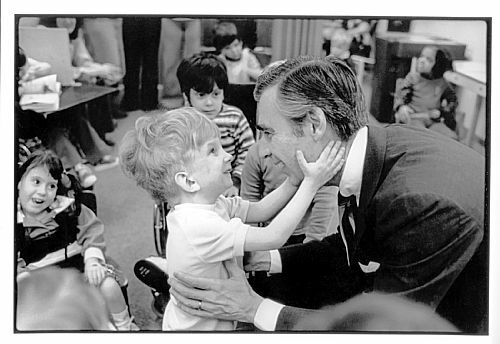 Fred Rogers was a Presbyterian minister who had a Bachelor’s degree in music composition. He also was a television personality best remembered for his show Mister Rogers’ Neighborhood. But how could the creator of characters such as King Friday and (my personal favorite) Purple Panda from Planet Purple inspire spiritually? When I watch reruns of his program, I am struck by his down-to-earth approach in which he speaks to children with respect and directness. Over the years, he helped children deal with issues ranging from being afraid of falling down the toilet to facing the death of a loved one. A deeply spiritual man, he had a grasp on the Christian message better than most. Thus, when asked to castigate gays, he said to gay people “God loves you just the way you are.” Such gentle acceptance stands as a beacon to all who claim to be Christian. 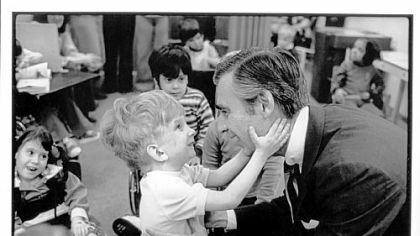 When I think of someone who emulates Jesus in a mixed-up modern world, I can find none better than Fred Rogers. Reflection: Who are some of your spiritual mentors? Afterword: I love the story of Fred Rogers getting onto a crowded subway in New York City and all the other passengers bursting into the Neighborhood theme song! This entry was posted in spirituality and tagged Fred Rogers, Mister Rogers' Neighborhood. Bookmark the permalink. Dr. Patterson was/is my therapist and I have found him not unlike Mister Rogers (and Carl Rogers). And the interesting thing is that, now that I am a therapist, I am like that too, almost unconsciously so. When I am not in the role of a therapist I can be pretty cranky, but that is another story. My patients are those with Schizophrenia, Schizoaffective Disorder, Bi-Polar Disorder and those with non-combat PTSD. When I was a kid, Mr. Rogers was strangely boring and compelling at the same time. The atmosphere that Fred cultivated on the show was so quiet and deliberate. I remember feelings sort of uncomfortable in my own skin, but liking that he was addressing things that I worried about. And I loved when it was time to go to make believe land. I think that the show planted a seed in me about being aware of myself and learning to accept myself just the way I am. At the moment, someone who really inspires me in a much less quiet way is Rob Brezny. I don’t look to his horoscopes for predictions, but for very interesting, active, creative, and mindbending ideas about what it is to be human. Also thought I’d repost this in celebration of this great man’s birthday!